Not to be confused with the Republic of Serbia. For other uses, see Serb Republic (disambiguation). Republika Srpska (/rɛpˈuːblikə sɜːrpskə/; Serbian Cyrillic: Република Српскa, pronounced [repǔblika sr̩pska] ( listen)) is one of the two political entities that compose Bosnia and Herzegovina, the other being the Federation of Bosnia and Herzegovina. Situated in the northern and eastern parts of the country, it is defined by its rich natural heritage, encompassing dense forests, mountains, and rivers. Its largest city and de facto capital, on the river Vrbas, is Banja Luka. "Моја Република" / "Moja Republika"
Although the northeastern Brčko District is formally held in condominium by both entities, it is a de facto third entity, as it has all the same powers as the other two entities and is under the direct sovereignty of Bosnia and Herzegovina. The Constitution of Republika Srpska avoids naming "Serbian, Bosnian, and Croatian", instead listing them as "the language of the Serb people, the language of the Bosniak people and the language of the Croat people" due to the ongoing debate over the separation of these languages. The territory that now makes up Republika Srpska, initially subject to Illyrian and Celtic settlement, was invaded by the Slavs in the 6th and 7th centuries and, in the mediaeval era, it was variously ruled by the Byzantine Empire, mediaeval Serbian states, the Frankish Empire, the Kingdom of Croatia, the Kingdom of Bosnia, the medieval Kingdom of Hungary and, by the end of the 15th century, the Ottoman Empire. After centuries of Ottoman-Habsburg conflict, the area became a part of the Kingdom of Serbs, Croats and Slovenes in 1918 following World War I. Following World War II, it became part of the Socialist Federal Republic of Yugoslavia as part of the Socialist Republic of Bosnia and Herzegovina. The creation of the modern entity of Republika Srpska dates to 1991, when six Serb Autonomous Regions united during the Yugoslav Wars. It achieved international recognition following the Dayton Accords and the end of the Bosnian War in 1995. Today, Republika Srpska maintains a parliamentary-style government, with the National Assembly holding legislative power within the entity. Republika Srpska is relatively centralised, although it is split into 2nd-level administrative units—municipalities, or opštine—of which there are 64. The legislature holds 83 seats, and the current session is the ninth since the formation of Republika Srpska. Republika Srpska, literally translated from Serbo-Croatian, means 'Serb Republic'. Although the name Republika Srpska is variously glossed in English as 'Serb Republic', 'Bosnian Serb Republic', or 'Republic of Srpska', the Constitution of Bosnia and Herzegovina and English-language news sources such as the BBC, The New York Times, and The Guardian generally refer to the entity by its untranslated name. According to Glas Srpske, a Banja Luka daily, the modern entity's name was created by its first minister of culture, Ljubomir Zuković. Archaeological evidence in Republika Srpska, as well as bordering areas of Bosnia and Herzegovina, attest to settlement since the Paleolithic. Specifically, in 1976, near the modern-day town of Stolac in the then-relatively hospitable Neretva basin, archaeological artifacts in the form of cave engravings in Badanj and deer bones in the area were discovered to show hunter-gatherer settlement from as far back as 14,000 to 10,000 BC. Within the wider region of Herzegovina, similar discoveries tie the region's early settlement to Montenegro and coastal Croatia. With the Neolithic, however, came more permanent settlement. Naturally, this occurred along the rivers of Bosnia and Herzegovina, as farming spread from the southeast; most notably, the Butmir culture developed near today's East Sarajevo, on the river Bosna. A variety of idols, mostly of female character, were found in the Butmir site, along with dugouts. With the Indo-European migrations of the Bronze Age came the first use of metal tools in the region. Along with this came the construction of burial mounds—tumuli, or kurgans. Remains of these mounds can be found in northwestern Bosnia near Prijedor, testament to not only denser settlement in the northern core of today's Republika Srpska but also Bronze Age relics. With the influx of the Iron Age, the Glasinac culture, developing near Sokolac in eastern Republika Srpska, was one of the most important of the country's long-standing Indo-European inhabitants, the Illyrians. Later, these Illyrians—the Autariatae—were influenced by the Celts after the Gallic invasion of the Balkans. With the end of the Illyrian Wars, most of Bosnia and Herzegovina and Republika Srpska came under Roman control within the province of Illyricum. In this period, the Romans consolidated the region through the construction of a dense road network and the Romanisation of the local population. Among these roads was the Via Argentaria, or 'Silver Way', which transported silver from the eastern mines of Bosnia to Roman population centres. Modern placenames, such as the Una and Sana rivers in the northwest, have Latin origins, meaning "the one" and "the healthy", respectively. This rule was not uninterrupted, however; with the suppression of the once-dominant Illyrian population came revolts such as the Bellum Batonianum. 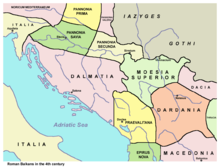 After 20 AD, however, the entirety of the country was conquered by the Romans and it was split between Pannonia and Dalmatia. The most prominent Roman city in Bosnia was the relatively small Servitium, near modern-day Gradiška in the northern part of the entity. Christianity spread to the region relatively late at least partially due to the countryside's mountainous nature and its lack of large settlements. In the fourth century, however, the country began to be Christianised en masse. With the split of the Western and Eastern Roman Empires in 395, modern-day Republika Srpska fell under the Western Roman Empire. Testament to its and Bosnia and Herzegovina's later religious polarization, it was later conquered as a frontier of the Eastern Roman Empire, a harbinger for religious division to come. With the loosening of Roman grip on the region came the Migration Period which, given Republika Srpska's position in southeastern Europe, involved a wide variety of peoples. Among the first was the invasion of Germanic peoples from the east, and the territory became a part of the Ostrogothic Kingdom in 476. The entirety of Bosnia became part of the Hungarian Crown Lands by the end of the 11th century. The area was known under Hungarian rule as the Banate of Bosnia. Later, however, with the rule of Ban Kulin, who is regarded as the founder of Bosnia, the region became de facto independent. In 1377, the Banate of Bosnia became the mediaeval Kingdom of Bosnia, under Tvrtko I of House of Kotromanić. Although modern-day Republika Srpska was an important part of the kingdom, its capitals were all located in the centre of the country, while the northern periphery of the country remained under nominal Hungarian rule as the region of Usora. Architectural legacies from this period include Kastel Fortress in Banja Luka, as well as castles, churches, and monasteries across the country. With the growth of the Ottoman Empire, Stefan Tomašević, the last Kotromanić ruler, surrendered Bosnia and Serbia to Ottoman tributary status. A Catholic, he was unpopular among the Orthodox population of Bosnia, as well as the members of the Bosnian Church. Refusing to pay tribute to Mehmed the Conqueror, King Stefan was executed and much of Bosnia fell under Ottoman rule in 1463 as the Eyalet of Bosnia. The entirety of the country fell in 1482, with the founding of the Sanjak of Herzegovina. Ottoman rule in modern-day Republika Srpska saw another addition to its religious fabric—Islam. Members of the Bosnian Church, as well as many Orthodox and Catholic Bosnians, gradually converted to Islam. This conversion was often peaceful but at times forceful—while many in the cities and densely populated areas converted voluntarily, for tax and other benefits, others in rural areas were forced to participate in the blood tax—the practice devshirme, in which children were taken from their Christian parents to be raised in the Ottoman court. The lack of peaceful conversion in rural, peripheral environments perhaps gives Republika Srpska its dramatic shape concentrated around the periphery and north of the country. Still, Ottoman rule left a profound architectural legacy in Bosnia and Herzegovina and Republika Srpska. Today, mosques dot parts of the entity's landscape—the most famous mosque is the Ferhadija mosque, located in Banja Luka. In addition, the subject of Ivo Andrić's book The Bridge on the Drina, Mehmed Paša Sokolović Bridge in Višegrad, was constructed by Mimar Sinan, the most famous Ottoman architect, in 1577, for Grand Vizier Sokollu Mehmed Pasha. Years earlier, the same Grand Vizier was born into an Orthodox family in a small town in Bosnia and taken from his parents as a child for upbringing as a janissary. His bridge is a symbol of the religious and cultural spans—and, eventually, conflict—that characterise Republika Srpska and Bosnia and Herzegovina. With the Ottoman-Habsburg conflicts of the late 17th and 18th centuries, parts of northern Republika Srpska became a part of the Habsburg Empire for relatively short periods of time. Rule was more permanent following Austro-Hungarian invasion in 1878. Characterised by economic and social development not seen in the by-then backwards Ottoman Empire, Austro-Hungarian rule was welcomed by many. However, many Muslims left Bosnia, leaving Serbs as the majority in the entirety of the Condominium. With the assassination of Archduke Franz Ferdinand of Austria, carried out by Bosnian Serb Gavrilo Princip, a member of the Yugoslavist Mlada Bosna, World War I broke out in 1914. Following the war, modern-day Republika Srpska was later incorporated into the Vrbas, Drina, and Zeta banovinas of the Kingdom of Serbs, Croats, and Slovenes, renamed Yugoslavia in 1929. Following the outbreak of World War II and the invasion of Yugoslavia in 1941, Republika Srpska fell under the rule of the Nazi-collaborationist Independent State of Croatia. Around 300,000 Serbs are estimated to have died under the Ustashe regime; a slew of massacres, as well as the use of a variety of concentration and extermination camps, took place in Republika Srpska during the war. The Jasenovac concentration camp, a few kilometres from the modern-day border with Croatia, was the site of the deaths of some 100,000 people, about 52,000 of which were Serbs. Massacres also occurred at Garavice and Kruščica concentration camp in the eastern part of Bosnia. Today, monuments honouring these victims can be found across Republika Srpska and Bosnia and Herzegovina. After World War II came a period of relative peace and economic development. Republika Srpska was incorporated into the Socialist Republic of Bosnia and Herzegovina. Ljubija mine and companies like Agrokomerc played a vital role in much of Republika Srpska's economic development. Literacy rates increased greatly, and the University of Banja Luka was founded in 1975. Representatives of main political parties and some other national organizations and institutions of Serb people in Bosnia and Herzegovina met on 13 October 1990 in Banja Luka and formed the 'Serbian National Council of Bosnia and Herzegovina' as a Serb political body. In a session on 14–15 October 1991, the People's Assembly of Bosnia and Herzegovina, then part of the Socialist Federal Republic of Yugoslavia, approved the 'Memorandum on Sovereignty', as had already been done by Slovenia and Croatia, as a way to proclaim independence from the rest of Yugoslavia. The memorandum was adopted despite opposition from 83 Serb deputies belonging to the Serb Democratic Party (most of the Serb parliamentary representatives) as well as the Serbian Renewal Movement and the Union of Reform Forces, who regarded the move as illegal. On 24 October 1991, the Serb deputies formed the Assembly of the Serb People in Bosnia and Herzegovina (Skupština srpskog naroda u Bosni i Hercegovini) to be the highest representative and legislative body of the Bosnian Serb population, ending the tripartite coalition. The Union of Reform Forces soon ceased to exist but its members remained in the assembly as the Independent Members of Parliament Caucus. The assembly undertook to address the achievement of equality between the Serbs and other peoples and the protection of the Serbs' interests, which they contended had been jeopardised by decisions of the Bosnian parliament. On 9 January 1992, the assembly proclaimed the Republic of the Serb People of Bosnia and Herzegovina (Republika srpskoga naroda Bosne i Hercegovine), declaring it part of Yugoslavia. On 28 February 1992, the assembly adopted the Constitution of the Serbian Republic of Bosnia and Herzegovina (the name adopted instead of the previous Republika srpskog naroda Bosne i Hercegovine), which would include districts, municipalities, and regions where Serbs were the majority and also those where they had allegedly become a minority because of persecution during World War II. The republic was part of Yugoslavia and could enter into union with political bodies representing other peoples of Bosnia and Herzegovina. The Bosnian parliament, without its Serb deputies, held a referendum on the independence of Bosnia and Herzegovina on 29 February and 1 March 1992, but most Serbs boycotted it since the assembly had previously (9–10 November 1991) held a plebiscite in the Serb regions, 96% having opted for membership of the Yugoslav federation formed by Serbia and Montenegro. The referendum had a 64% turnout and 92.7% or 99% (according to different sources) voted for independence. On 6 March the Bosnian parliament promulgated the results of the referendum, proclaiming the republic's independence from Yugoslavia. The republic's independence was recognised by the European Community on 6 April 1992 and by the United States on 7 April. On the same day the Serbs' assembly in session in Banja Luka declared a severance of governmental ties with Bosnia and Herzegovina. The name Republika Srpska was adopted on 12 August 1992. Radovan Karadžić (left), former president of Republika Srpska, and Ratko Mladić (right), former Chief of Staff of the Army of Republika Srpska. Both men were charged with, and subsequently found guilty of, war crimes (including genocide) by the International Criminal Tribunal for the Former Yugoslavia based in The Hague, Netherlands. The political controversy escalated into the Bosnian War, which would last until the autumn of 1995. The war was ended by the General Framework Agreement for Peace in Bosnia and Herzegovina, reached at Wright-Patterson Air Force Base near Dayton, Ohio, on 21 November and formally signed in Paris on 14 December 1995. Annex 4 of the Agreement is the current Constitution of Bosnia and Herzegovina, recognising Republika Srpska as one of its two main political-territorial divisions and defining the governmental functions and powers of the two entities. The boundary lines between the entities were delineated in Annex 2 of the Agreement. Between 1992 and 2008, the Constitution of Republika Srpska was amended 121 times. Article 1 states that Republika Srpska is a territorially unified, indivisible and inalienable constitutional and legal entity that shall independently perform its constitutional, legislative, executive, and judicial functions. The war in Bosnia and Herzegovina resulted in major changes in the country, some of which were quantified in a 1998 UNESCO report. Some two million people, about half the country's population, were displaced. In 1996 there were some 435,346 ethnic Serb refugees from the Federation in Republika Srpska, while another 197,925 had gone to Serbia. In 1991, 27% of the non-agricultural labour force was unemployed in Bosnia and this number increased due to the war. By 2009, the unemployment rate in Bosnia and Herzegovina was estimated at 29%, according to the CIA's The World Factbook. Republika Srpska's population of Serbs had increased by 547,741 due to the influx of ethnic Serb refugees from the Federation of Bosnia and Herzegovina and the former unrecognised state of the Republic of Serbian Krajina in the new Republic of Croatia. In Eastern Bosnia, Bosnian Serbs besieged the town of Srebrenica, among others. Srebrenica was declared a UN 'Safe Area' in 1993 and it served as an enclave for Muslim refugees for the final years of the Bosnian War. In the middle of July 1995, more than 8,000 Muslim Bosniaks, mainly men and boys, in and around the town of Srebrenica, were killed in what became known as the Srebrenica massacre. The number of Croats was reduced by 135,386 (the majority of the pre-war population), and the number of Bosniaks by some 434,144. Some 136,000 of approximately 496,000 Bosniak refugees forced to flee the territory of what is now Republika Srpska have since returned home. As of 2008[update], 40% of Bosniaks and 8.5% of Croats had returned to Republic Srpska, while 14% of Serbs who left their homes in territories controlled by Bosniaks or Croats, also returned to their pre-war communities. In the early 2000s, discrimination against non-Serbs was alleged by NGOs and the Helsinki Commission. The International Crisis Group reported in 2002 that in some parts of Republika Srpska a non-Serb returnee is ten times more likely to be the victim of violent crime than is a local Serb. The Helsinki Commission, in a 2001 statement on 'Tolerance and Non-Discrimination', pointed at violence against non-Serbs, stating that in the cities of Banja Luka and Trebinje, mobs attacked people who sought to lay foundations for new mosques. Non-Serbs have reported continuing difficulties in returning to their original homes and the assembly has a poor record of cooperation in apprehending individuals indicted for war crimes, crimes against humanity, and genocide. Organizations such as the Society for Threatened Peoples, reporting to the United Nations Human Rights Council in 2008, have made claims of discrimination against non-Serb refugees in Republika Srpska, particularly areas with high unemployment in the Drina Valley such as Srebrenica, Bratunac, Višegrad, and Foča. According to the Ministry for Human Rights and Refugees of Bosnia and Herzegovina, European Union Police Mission, UNHCR, and other international organizations, security in both Republika Srpska and the Federation of Bosnia and Herzegovina is at present satisfactory, although some minor threats, real or perceived, can still influence the decision of individuals as to whether they will return to their pre-war addresses or not. Situated in Southeast Europe, Republika Srpska is located on the Balkan Peninsula, with its northern extents reaching into the Pannonian Basin. Republika Srpska lies between latitudes 42° and 46° N and longitudes 16° and 20° E. The entity is split into two main parts by the Brčko District; a hilly western part, consisting of flatter areas in the north, and a more varied eastern part, with high mountains in the south and flat, fertile farmland in the north. Republika Srpska, unlike its counterpart entity, is landlocked. Like the rest of Bosnia and Herzegovina, Republika Srpska is split into a Bosnian region in the north and a Herzegovinian region in the far south. Within these two macroregions exist smaller geographical regions, from the forested hills of Bosanska Krajina in the northwest to the fertile plains of Semberija in the northeast. Republika Srpska covers 24,525 square kilometres (9,469 square miles), excluding the Brčko District, which is held in condominium by both entities, but is de facto sovereign within Bosnia and Herzegovina. Republika Srpska, if it was a country, would be 149th largest in the world. Elevation varies greatly, with Maglić, a peak in the Dinaric Alps near Montenegro, reaching 2,386 metres (7,828 ft), and parts nearer the Adriatic going down to sea level. The largest and most popular ski resort in Bosnia and Herzegovina is situated on the slopes of the mountain Jahorina, in the eastern part of the entity. Other mountains in Republika Srpska include Kozara, Romanija, Bjelašnica, Motajica and Treskavica. Republika Srpska shares international borders with Croatia to the north, Serbia to the east, and Montenegro to the southeast. Within Bosnia and Herzegovina, the Inter-Entity Boundary Line (IEBL) forms Republika Srpska's border with the Federation of Bosnia and Herzegovina, and essentially follows the front lines at the end of the Bosnian War with some adjustments (most importantly in the western part of the country and around Sarajevo) as defined by the Dayton Agreement. The total length of the IEBL is approximately 1,080 km. The IEBL is an administrative demarcation uncontrolled by military or police and there is free movement across it. Republika Srpska is one of the most forested areas in Europe, with over 50% of its area consisting of forest cover. Perućica is one of the last old-growth forests in Europe. Two densely-wooded national parks—Sutjeska National Park and Kozara National Park—are located in the entity. Most rivers belong to the Black Sea drainage basin. The principal rivers are the Sava, a tributary of the Danube that forms the northern boundary with Croatia; the Bosna, Vrbas, Sana and Una, which flow north and empty into the Sava; the Drina, which flows north, forms part of the eastern boundary with Serbia, and is also a tributary of the Sava. The Trebišnjica is one of the longest sinking rivers in the world. It belongs to the Adriatic Sea drainage basin. Skakavac Waterfall on the Perućica is one of the highest waterfalls in the country, at about 75 metres (246 feet) in height. The most important lakes are Bileća Lake, Lake Bardača (which includes a protected wetland area) and Balkana Lake. As of the 2013 census[update], Republika Srpska (excluding the Brčko District) has a total population of 1,218,107 and a population density of 53.3 inhabitants per square kilometre; both of these figures are lower than in Republika Srpska's counterpart entity, the Federation of Bosnia and Herzegovina. The overall life expectancy in Republika Srpska at birth was 77.20 years in 2017. The total fertility rate in Republika Srpska is, as of 2012, 1.2 children per mother—one of the world's lowest. In 2017, the total number of live births, according to the Institute of Statistics of Republika Srpska (RZS), was 9,339. That same year, the number of deaths was 14,663, resulting in a natural population decrease. Along with this natural population decrease is a great amount of emigration: 60,000 have left the entity in recent years for opportunities in the nearby European Union and beyond, according to the RZS. Literacy in Republika Srpska stands at 96.8 percent as of 2013. Free primary education is provided as a right to all people in Republika Srpska and Bosnia and Herzegovina. There are 187 primary schools in addition to 11 music schools and 4 centres of education for students with learning disabilities. Secondary education exists in three main channels: three-year vocational schools, four-year technical schools, and four-year grammar schools (gimnazije). Ten independent grammar schools exist, while an additional 30 are integrated into other schools. Music schools offer another option for students to continue their education following primary school. The oldest and largest public university in Republika Srpska is the University of Banja Luka, which was established in 1975. The second of two public universities in Republika Srpska is University of East Sarajevo. After the end of the Yugoslav wars several private institutions of higher education were established, including: American University in Bosnia and Herzegovina, Slobomir University, Pan-European University “APEIRON” [sr] and University Sinergija. The Academy of Sciences and Arts of Republika Srpska, founded in 1996, is the highest representative institution of science and art in Republika Srpska. National and University Library of Republika Srpska is a national library, located in Banja Luka. The Museum of Contemporary Art (MSURS) houses a collection of Yugoslav and international art and is located in Banja Luka. There has been controversy around who is counted in the population census. The first row reflects the total population present in Republika Srpska, while the second row includes people who live and work abroad. Republika Srpska, in monetary union with the Federation of Bosnia and Herzegovina, uses the Bosnia and Herzegovina convertible mark (KM). The currency is pegged to the euro at a unit rate of 1.95583 convertible marks. Along with the rest of Bosnia and Herzegovina, Republika Srpska is classified as an upper-middle income economy by the United Nations. According to the IRBRS, the entity's development bank, Republika Srpska's nominal GDP per capita is 8,739 KM (€4,457) as of 2017. The average net wage, according to RZS, the entity's institute for statistics, is 896 KM (€458) per month as of February 2019, a nominal growth of 1.0% compared to the previous month. Republika Srpska's largest exporter is EFT Stanari, among the largest energy companies in southeastern Europe. Steel, lead, and zinc are also important products of Republika Srpska, along with chemical products. An agreement on strategic partnership has been concluded between the iron ore mine in Ljubija near Prijedor and the British company LNM (a major steel producer, now part of ArcelorMittal). Yuzhuralzoloto Gruppa Kompaniy OAO from Russia signed a strategic partnership with the Lead and Zinc Mine Sase, in Srebrenica. Recent foreign investments include privatisation of Telekom Srpske, sold to the Serbian Telekom Srbija for €646 million, and the sale of the petroleum and oil industry, based in Brod, Modriča and Banja Luka, to Zarubezhneft of Russia, whose investment is expected to total US$970 million in coming years. On 16 May 2007, the Czech power utility ČEZ signed a €1.4 billion contract with the Elektroprivreda Republike Srpske, to renovate the Gacko I power plant and build a second, Gacko II. As of September 2012, the President of Republika Srpska, Milorad Dodik, has signed an agreement with the Russian company Gazprom to build a part of the South Stream pipeline network and two gas power plants in the entity. Since 2001, Republika Srpska initiated significant reforms in the sector of the tax system, which lowered the tax burden to 28.6%, one of the lowest in the region. The 10% rate of capital gains tax and income tax are among the lowest in Europe and could theoretically stimulate foreign investment, and there are no limits on the amount of earnings. Increasing the number of taxpayers and budgeted incomes, and creating a stable fiscal system, were necessary[according to whom?] for further reforms in the fields of taxation and duties; this area is a priority goal of Republika Srpska authorities. VAT has been introduced in 2006. These tax advantages have led to some companies moving their business to Republika Srpska from the other entity. According to its constitution, Republika Srpska has its own president, legislature (the 83-member unicameral National Assembly of Republika Srpska), executive government, police force, court system, customs service (under the state-level customs service), and postal service. It also has official symbols, including a coat of arms, a flag (a variant of the Serbian flag without the coat of arms displayed) and its entity anthem. The Constitutional Law on the Coat of Arms and Anthem of Republika Srpska was ruled not in concordance with the Constitution of Bosnia and Herzegovina as it states that those symbols 'represent the statehood of Republika Srpska' and are used 'in accordance with moral norms of the Serb people'. According to the Constitutional Court's decision, the Law was to be corrected by September 2006. Republika Srpska later changed its emblem. Although the constitution names East Sarajevo as the capital of Republika Srpska, the northwestern city of Banja Luka is the headquarters of most of the institutions of government, including the parliament, and is therefore the de facto capital. After the war, Republika Srpska retained its army, but in August 2005, the parliament consented to transfer control of Army of Republika Srpska to a state-level ministry and abolish the entity's defence ministry and army by 1 January 2006. These reforms were required by NATO as a precondition of Bosnia and Herzegovina's admission to the Partnership for Peace programme. Bosnia and Herzegovina joined the programme in December 2006. In September 2006, Republika Srpska officials signed a 'special ties agreement' with Serbia aimed at promoting economic and institutional cooperation between Serbia and Republika Srpska. The accord was signed by Serbia's President Boris Tadić and Prime Minister Vojislav Koštunica, former Republika Srpska President Dragan Čavić, and Republika Srpska Prime Minister Milorad Dodik. In February 2009, Republika Srpska opened a representative office in Brussels. While European Union representatives were not present at the ceremony, top Republika Srpska officials attended the event, saying it would advance their economic, political and cultural relations with the EU. This notion has been strongly condemned by Bosniak leaders, saying that this is further proof of Republika Srpska distancing itself from Bosnia and Herzegovina. The president of Republika Srpska, Rajko Kuzmanović, told reporters that this move did not jeopardise Republika Srpska's place within Bosnia and Herzegovina. He added that Republika Srpska merely used its constitutional right 'to open up a representation office in the centre of developments of European relevance'. Republika Srpska maintains official offices in Belgrade, Moscow, Stuttgart, Jerusalem, Thessaloniki, Washington D.C., Brussels, and Vienna. According to the Law on Holidays of Republika Srpska, public holidays are divided into three categories: entity holidays, religious holidays, and holidays which are marked but do not include time off of work. The entity holidays include New Year's Day (1 January), Entity Day (9 January), International Workers' Day (1 May), Victory over Fascism Day (9 May) and Day of the General Framework Agreement for Peace in Bosnia and Herzegovina (21 November). Religious holidays include Christmas and Easter according to both the Julian and the Gregorian calendars for, respectively, Serbian Orthodox Christians and Roman Catholics, as well as Kurban Bajram and Bajram for Muslims. Holidays which are marked but do not include time off work include School Day (the Feast of Saint Sava, 27 January), Day of the Army of Republika Srpska (12 May), Interior Ministry Day (4 April), and Day of the First Serbian Uprising (14 February). The most important of the entity holidays is the Day of Republika Srpska, which commemorates the establishment of Republika Srpska on 9 January 1992. It coincides with Saint Stephen's Day according to the Julian calendar. The Orthodox Serbs also refer to the holiday as the slava of Republika Srpska, regarding Saint Stephen as the patron saint of the entity. The holiday has therefore, a religious dimension, being celebrated with special services in Serbian Orthodox churches. Republika Srpska does not recognise the Independence Day of Bosnia and Herzegovina (1 March). ^ "Constitution of the Republika Srpska-Official Web Site of the Office of the High Representative". Archived from the original on 1 October 2008. Retrieved 13 September 2008. ^ Sarajevo, juni 2016. CENZUS OF POPULATION, HOUSEHOLDS AND DWELLINGS IN REPUBLIKA SRPSKA, 2013 FINAL RESULTS. BHAS. Archived from the original on 1 January 2017. Retrieved 30 June 2016. ^ "Preliminary Results of the 2013 Census of Population, Households and Dwellings in Bosnia and Herzegovina" (PDF). Agency for Statistics of Bosnia and Herzegovina. 5 November 2013. Archived (PDF) from the original on 13 November 2013. Retrieved 11 November 2013. ^ "Sub-national HDI - Area Database - Global Data Lab". hdi.globaldatalab.org. Archived from the original on 23 September 2018. Retrieved 3 December 2018. ^ "Decision on Constitutional Amendments in Republika Srpska". Office of the High Representative. Archived from the original on 18 January 2012. Retrieved 3 June 2010. ^ "Bosnia-Herzegovina profile". BBC. Archived from the original on 11 April 2013. Retrieved 14 April 2013. ^ Related Articles. "Serb Republic (region, Bosnia and Herzegovina) – Britannica Online Encyclopedia". Britannica.com. Archived from the original on 23 December 2008. Retrieved 29 August 2010. ^ "Bosnian Serb republic leader dies". BBC News. 30 September 2007. Retrieved 22 May 2010. ^ Moss, Paul (27 June 2009). "Bosnia echoes to alarming rhetoric". BBC News. Archived from the original on 27 October 2014. Retrieved 22 May 2010. ^ Lyon, James (4 December 2009). "Halting the downward spiral". The New York Times. Archived from the original on 20 May 2013. Retrieved 22 May 2010. ^ Beaumont, Peter (3 May 2009). "Bosnia lurches into a new crisis". The Guardian. London, UK. Archived from the original on 6 September 2013. Retrieved 22 May 2010. ^ "Kako je nastalo ime Republika Srpska". Glas Srpske. Archived from the original on 8 April 2019. Retrieved 8 April 2019. ^ "Službene stranice Općine Stolac - Badanj - paleolitsko nalazište". stolac.gov.ba. Archived from the original on 14 September 2018. Retrieved 8 April 2019. ^ a b Babaic, Haris (Spring 2019). "Prethistorija na tlu BiH": 1–2. ^ Wilkes, John (1996). The Illyrians. Oxford, United Kingdom: Blackwell Publishing. ISBN 0-631-19807-5. ^ Lückemeier, K. "The spread of Christianity in the Roman Empire". Diercke. Retrieved 8 April 2019. ^ Velikonja, Mitja (2003). Religious Separation and Political Intolerance in Bosnia-Herzegovina. Texas A&M University Press. pp. 130–135. ISBN 1-58544-226-7. ^ Yeomans, Rory (2013). Visions of Annihilation: The Ustasha Regime and the Cultural Politics of Fascism, 1941-1945. Pittsburgh: University of Pittsburgh Press. p. 18. ^ "JASENOVAC". United States Holocaust Memorial Museum. Archived from the original on 3 April 2019. Retrieved 12 April 2019. ^ "Foreign Broadcast Information Service Daily Reports: Eastern Europe (1990). p. 58-59". Archived from the original on 9 December 2018. Retrieved 7 December 2018. ^ Silber, Laura (16 October 1991). "Bosnia Declares Sovereignty". The Washington Post: A29. ISSN 0190-8286. Archived from the original on 27 May 2017. Retrieved 4 December 2017. ^ Kecmanović, Nenad. "Dayton Is Not Lisbon". NIN. ex-yupress.comex-yupress.comex-yupress.com. Archived from the original on 5 June 2011. Retrieved 8 April 2015. ^ a b "The Decision on Establishment of the Assembly of the Serb People in Bosnia and Herzegovina". Official Gazette of the Serb People in Bosnia and Herzegovina (in Serbian). 1 (1): 1. 15 January 1992. ^ Women, violence, and war: wartime ... Google Books. 2000. ISBN 978-963-9116-60-3. Retrieved 29 August 2010. ^ "The Declaration of Proclamation of the Republic of the Serb People of Bosnia and Herzegovina". Official Gazette of the Serb People in Bosnia and Herzegovina (in Serbian). 1 (2): 13–14. 27 January 1992. ^ "The Constitution of the Serbian Republic of Bosnia and Herzegovina". Official Gazette of the Serb People in Bosnia and Herzegovina (in Serbian). 1 (3): 17–26. 16 March 1992. ^ Saving strangers: humanitarian. Google Books. 2000. ISBN 978-0-19-829621-8. Archived from the original on 27 June 2014. Retrieved 29 August 2010. ^ "The Decision on Proclamation of the Serbian Republic of Bosnia and Herzegovina". Večernje novosti (in Serbian). Belgrade: Novosti a.d. Tanjug. 8 April 1992. ISSN 0350-4999. ^ "The Amendments VII and VIII to the Constitution of the Republika Srpska". Official Gazette of the Republika Srpska (in Serbian). 1 (15): 569. 29 September 1992. ^ "Prosecutor v. Radovan Karadžić – Second Amended Indictment" (PDF). UN International Criminal Tribunal for the former Yugoslavia. 26 February 2009. Archived (PDF) from the original on 6 June 2011. Retrieved 18 August 2009. ^ "The General Framework Agreement for Peace in Bosnia and Herzegovina". OHR.int. Archived from the original on 4 June 2015. Retrieved 28 May 2015. ^ "Constitution of Republika Srpska". The Constitutional Court of Republika Srpska. Archived from the original on 6 April 2009. Retrieved 28 October 2015. ^ UNESCO (1998). "Review of the education system in the Republika Srpska". Archived from the original on 7 December 2014. Retrieved 10 January 2009. ^ The World Factbook Archived 6 April 2011 at the Wayback Machine, cia.gov; accessed 8 April 2015. ^ Press Online Republika Srpska: Od pola miliona, u FBiH ostalo 50.000 Srba Archived 2 February 2012 at the Wayback Machine, pressrs.ba; accessed 8 April 2015. ^ "Written statement submitted by the Society for Threatened Peoples to the Commission of Human Rights; Sixtieth session Item 11 (d) of the provisional agenda". United Nations. 26 February 2004. p. 2. Archived from the original on 30 August 2017. Retrieved 13 July 2015. ^ a b Revidirana strategija Bosne i Hercegovine za provedbu Aneksa VII Dejtonskog mirovnog sporazuma Archived 15 February 2010 at the Wayback Machine. Ministry for Human Rights and Refugees of Bosnia and Herzegovina (mhrr.gov.ba), October 2008; accessed 13 July 2015. ^ "The Continuing Challenge of Refugee Return in Bosnia & Herzegovina". Crisis Group. 13 December 2002. Archived from the original on 19 April 2009. ^ "UN Condemns Serb 'Sickness'". BBC. 8 May 2001. Archived from the original on 23 October 2007. Retrieved 4 January 2010. ^ "Serbs Block Bosnia Mosque Ceremony". BBC. 6 May 2001. Archived from the original on 8 November 2010. Retrieved 4 January 2010. ^ "Helsinki Commission Releases U.S. Statement on Tolerance and Non-Discrimination at OSCE Human Dimension Implementation Meeting". Helsinki Commission. 20 September 2001. Archived from the original on 11 May 2015. Retrieved 8 April 2015. ^ "7th Session of the UN Human Rights Council" (PDF). Society for Threatened Peoples. 21 February 2008. p. 2. Archived from the original (PDF) on 19 July 2011. Retrieved 12 May 2009. ^ "Ski resort Jahorina". Archived from the original on 11 April 2019. Retrieved 9 April 2019. ^ Cox, Marcus (2003). Building Democracy from the Outside : the Dayton Agreement in Bosnia and Herzegovina. London: Zed Books. pp. 253–276. ISBN 1-84277-150-7. ^ Perućica Official website Archived 23 July 2015 at the Wayback Machine, npsutjeska.net; accessed 24 November 2015. ^ "Abbreviated (approximate) life tables, 2017". Republika Srpska Institute of Statistics (RZS). Archived from the original on 15 April 2019. Retrieved 14 April 2019. ^ Misljenovic, S. (16 January 2018). "Srpsku napustilo 60.000 mladih!". Novosti.rs. Archived from the original on 1 July 2018. Retrieved 14 April 2019. ^ Belgrade, Computing Centre, School of Electrical Engineering, University of. "About the University | UNIBL". www.unibl.org. Archived from the original on 29 June 2018. Retrieved 29 June 2018. ^ "University of East Sarajevo | Rethinking the Culture of Tolerance 2016". kultor.org. Archived from the original on 8 May 2018. Retrieved 29 June 2018. ^ "Anurs". www.anurs.org. Archived from the original on 29 June 2018. Retrieved 29 June 2018. ^ "Museum of Contemporary Art of Republika Srpska". museu.ms. Archived from the original on 29 June 2018. Retrieved 29 June 2018. ^ "Републички завод за статистику - Република Српска". Rzs.rs.ba. Archived from the original on 19 August 2017. Retrieved 4 January 2018. ^ "World Bank Country and Lending Groups". Archived from the original on 11 January 2018. ^ "RZS". Archived from the original on 21 May 2011. ^ "Company registration in RS – do you know how?". Srpska Times. 31 July 2017. Archived from the original on 4 November 2017. ^ "Baza podataka o ekonomskim indikatorima Republike Srpske – IRBRS". Irbrs.net. Archived from the original on 26 April 2012. Retrieved 4 January 2018. ^ "Commercial Credit Report for Yuzhuralzoloto Gruppa Kompaniy OAO (P) - Report Preview". Crmz.com. Archived from the original on 27 October 2015. Retrieved 4 January 2018. ^ "Investicija za preporod privrede BiH". Nezavisine novine. 25 January 2007. Archived from the original on 28 September 2007. Retrieved 19 April 2007. ^ "CEZ signs contract on energy project in Bosnia". Prague Daily Monitor. 17 May 2007. Archived from the original on 21 May 2007. Retrieved 17 June 2007. ^ Bosnia's Serb Entity Signs up for South Stream Pipeline Archived 9 May 2013 at the Wayback Machine, Balkaninsight.com; accessed 8 April 2015. ^ "Statistical Yearbook of Republika Srpska 2016" (PDF). Rzs.rs.ba. Archived (PDF) from the original on 9 September 2017. Retrieved 4 January 2018. ^ "RS external trade statistics, annual release 2016" (PDF). 2.rzs.rs.ba. Archived (PDF) from the original on 9 September 2017. Retrieved 4 January 2018. ^ Kampschror, Beth (15 May 2007). "Bosnian Territory Opens Doors for Business". The Wall Street Journal. Archived from the original on 5 January 2018. Retrieved 17 June 2007. ^ "Signatures of Partnership for Peace Framework Document". NATO. Archived from the original on 11 March 2012. Retrieved 5 March 2016. ^ a b "Zakon o praznicima Republike Srpske". Zakoni (in Serbian). People's Assembly of Republika Srpska. 27 July 2005. Archived from the original on 11 June 2009. Retrieved 10 April 2009. Wikimedia Commons has media related to Republika Srpska.